Spot welders are used in dental laboratories to repair various dental treatments and repair or heat orthodontic materials through electro soldering, spot welding and heat-treating. They may also be used for wire annealing. A spot welder may feature a Y-shaped handle for vertical clearance for large appliances. A variety of power settings should be available along with manual control. A foot pedal control may allow for “hands-free” operation. 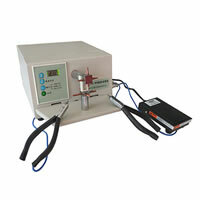 A spot welder usually comes standard with a copper electrode and a carbon-soldering tip. An array of additional electrodes may be purchased separately. Be sure to choose a reputable vendor who specializes in dental and orthodontic laboratory equipment.